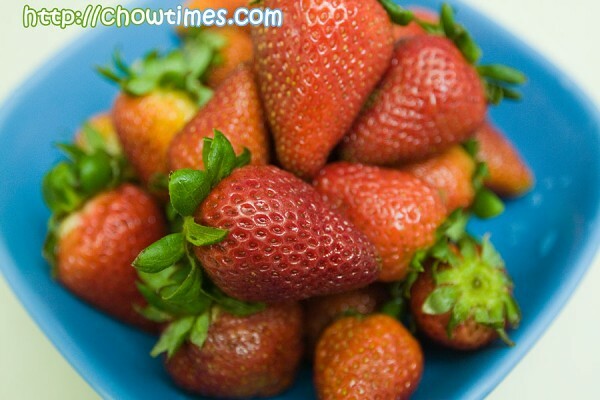 It’s strawberry season. Ben brought home a 4 lb pack one day after work as he found a good deal at the groceries store, $4.98 for 4 lbs. Ben usually does not do groceries shopping. It just happened that he was looking for some stationery in the Real Canadian Superstore and saw the good deal. With so much strawberries, I quickly check my pantry and found a pack of Dr. Oetker Jam Express Gelling Powder which I bought a couple of months ago. I wanted to make some blueberries jam but do not get down to do it. So, this is just great for making strawberry jam. 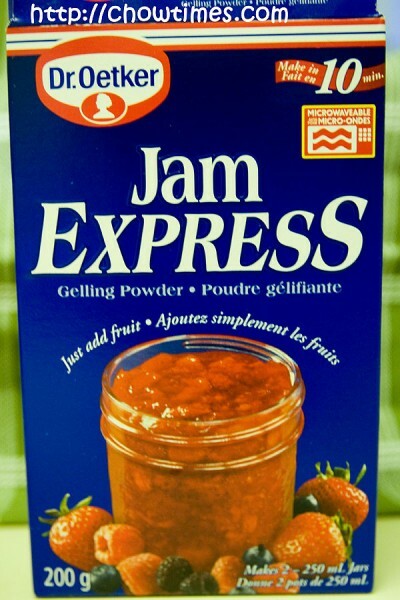 I like Dr. Oetker Jam Express Gelling Powder for it’s simplicity to use and no additional sugar is required. You can use it to make jam from various fruit like raspberry, blueberry, blackberry and other fruits or blends. If you use defrosted frozen fruit, include the juice which will enhance the flavour and recipe only requires 1 3/4 cup of chopped defrosted frozen fruit. 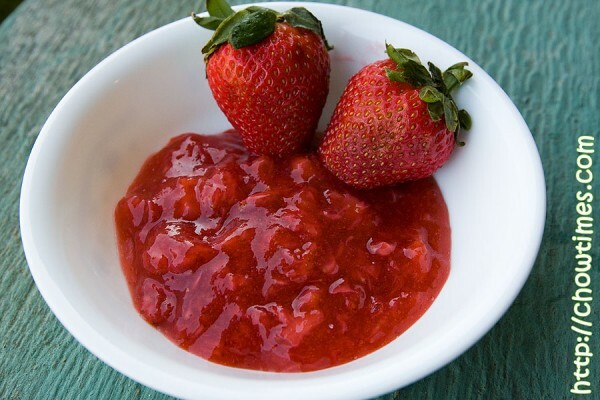 Nothing beats some freshly home-made strawberry jam on a toast. 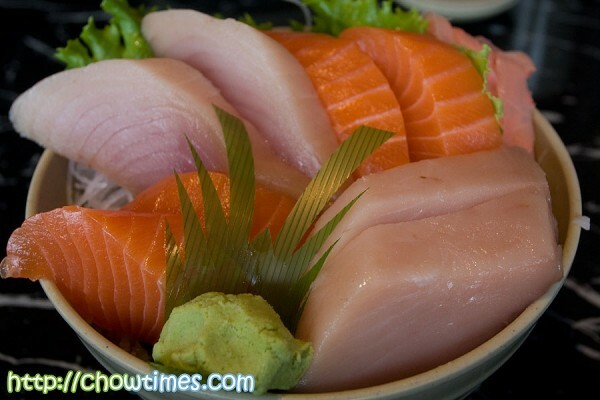 We raved about our find at Jumbo Sushi just a couple of weeks ago. It was not because Jumbo Sushi is good or anything like that. It was because they serve HUGE JUMBO sized sushi for cheap. It was just perfect for my boys who can devour sushis like there is no tomorrow. Jumbo Sushi WAS the boys favourite for just two weeks. 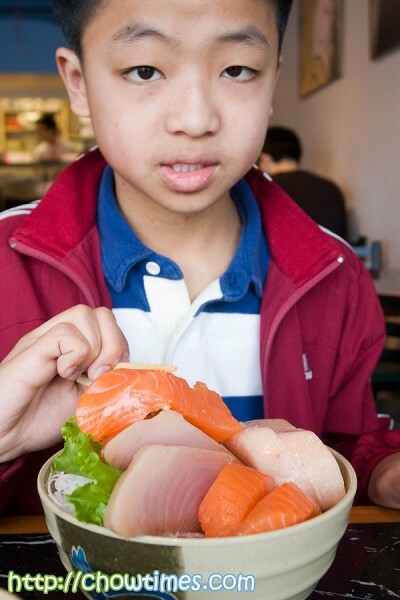 The family favourite is now the Banzai Sushi House (thanks to the recommendation of Vanessa, again). 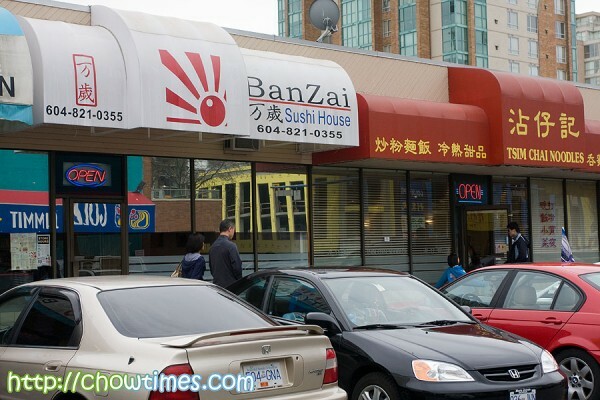 Banzai Sushi is located on Westminster Highway in the strip mall across from the Richmond Public Market. It is actually just next door to Tsim Chai Noodles. For some reason, I had never taken notice of Banzai Sushi before … strange. The picture above is somewhat misleading. We were the first customer as soon as they open at 11AM. Shortly after, it was all packed — certainly a very popular place and to think that I thought there were no sushi places of note in Richmond. Nanzaro ordered the Tuna and Salmon Sashimi. This is just over $9.25. But they are HUGE … everyone of them. It was mind boggling seeing sashimi pieces these big. Nanzaro was absolutely delighted with his bowl and tried his best not to smirk at his older brother’s selection. It was not often that Nanzaro beats Arkensen in anything. Just look at the size of it one more time. It is just this thing alone that I am sure we will be making repeat trips to Banzai Sushi. Size DOES matter. Arkensen selected from the Maki Combo B. 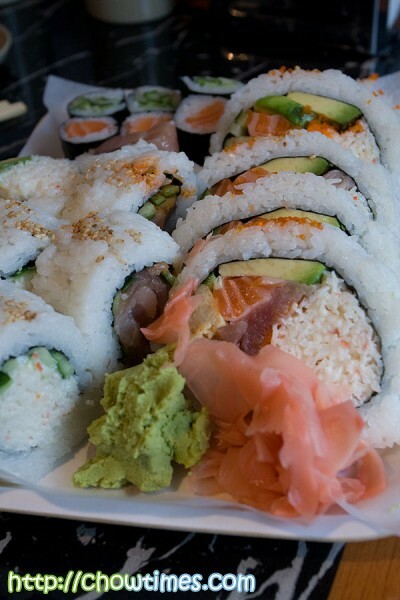 This is $9 and consists of five types of half rolls. I was telling Suanne that Vanessa (who we had never met) is like our eating consultant. This time she brought to our attention of a new Hongkong Style Cafe in Richmond. Come to think about it, we had not come across any new Hongkong Style Cafes for quite a long time. 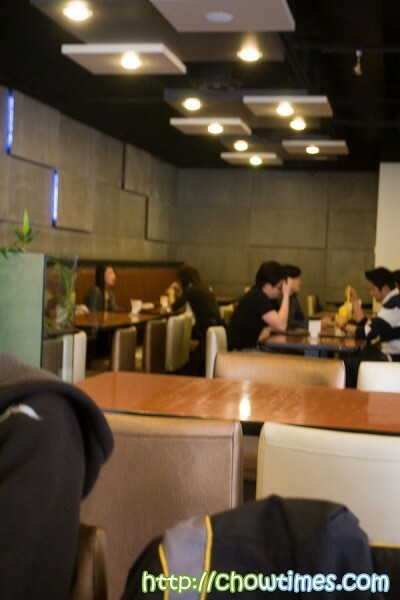 It is like Hongkong Style Cafes out of fashion these days along with Vietnamese Pho and Taiwanese Beef Noodle Houses. 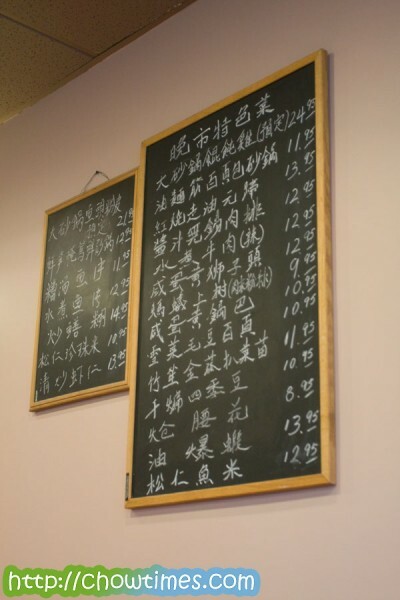 Instead there are more and more mainland Chinese restaurants, particularly Shanghainese and Szechuan. I think it is due to the shifting demographics of the Chinese immigrants to Richmond the past few years. 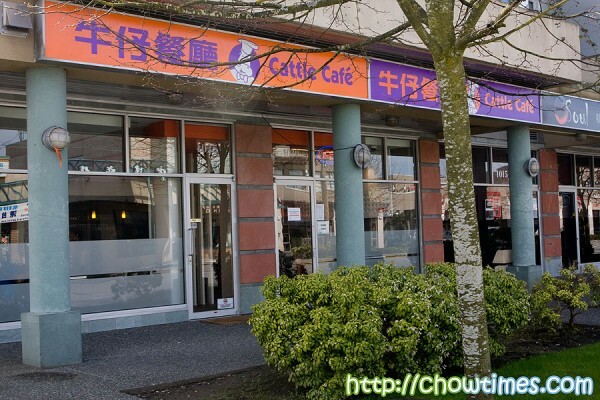 Cattle Cafe is located on the Alexandra Road in Richmond. Alexandra Road is the “wai sek kai” of Richmond. Concentrated on this block is some of the better restaurants ranging from cheap eats to high class restaurants with chandeliers. The parking on this street is impossible especially during dinner time on weekends. Cattle Cafe is new alright. Everything is so sparkling clean and new. The decor is bright with clean lines … certainly a lot better looking than the oldies like Kam Do, Silver Tower, Lido, E-Canteen and such. The place is not too big, perhaps half the size of Kam Do. It was quite busy when we were there and had to wait for a table. Talking about tables, BOTH our tables were unbalanced and shakey for the good part of the time we were there. For as long as I remember, I had not come across having an unbalanced table, let alone two. I blame it on their relative newness and oversight. No big deal but it was downright annoying when one is having noodle soup. You gotta love these type of new places where everything is new. Even the cutleries are shiny. Service too was very quick and eager — we like that and does feel our patronage was appreciated. 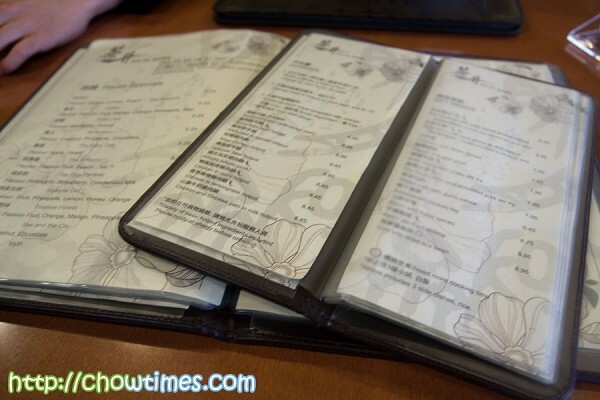 Their menu is where they are different from all the other Hongkong Style Cafes. 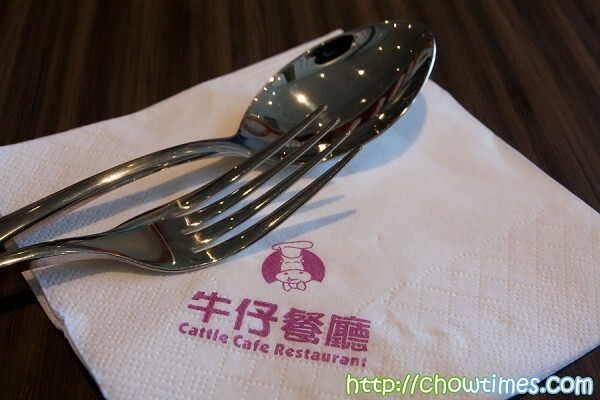 Instead of huge menu itemizing every single combination possible, Cattle chooses to do it choose-and-mix style. 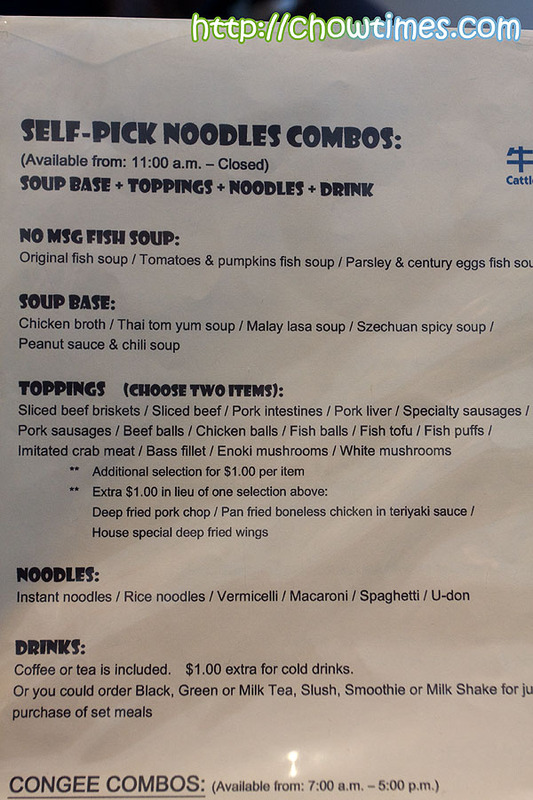 For instance, their Self-Pick Noodles Combo allows you to assemble your own noodle by selecting a soup base, choice of two toppings, the noodle type and a beverage. You may sort of upgrade for a price. It is not just combo for noodles but also for congee and toasts too. It’s a good way for their customer to have their food the way they need it. Suanne is getting smarter these days. You see, there is an unwritten rule that we cannot order the same food … this is because we are bloggers and we want to try as many different ones as possible. She used to end up with the short end of the stick after the boys and I get all the better ones first. Suanne is fast these days … she will “chop” the signature dishes before we even get the chance to say what we wanted. So Suanne ended up with the Self-Pick Noodle Combo … which is just $7. I think it is a good deal. She had the Szechuan Spice Soup Base. I tried to influence her to get the Laksa Soup Base because I see a lot of other people having that. No deal, she said. For toppings, she had pork intestines and fish puffs. For noodles, she had rice noodles (I thought egg noodles is a better combination). Hot Milk Tea was her choice of beverage. Just in case you don’t already know, the coffee war down south had just spilled over the border to Canada. 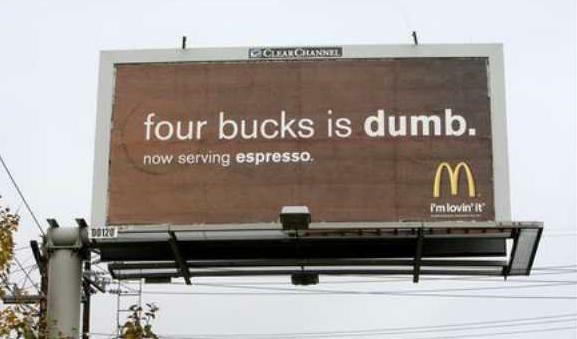 A few months ago, McDonalds setting its sights on Starbucks fired the opening salvo by putting up billboards that proclaimed “four bucks is dumb”. Dozens of these billboards were erected in the Washington state and from what I read, there is even one erected right in front of the Starbucks HQ in Seattle. It was direct confrontation of the specialty coffee market in the US. 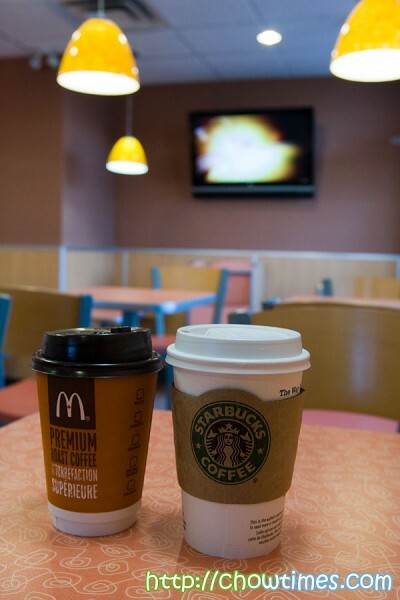 Last week, the coffee war came to Canada when McDonalds announced that you could get a free coffee during breakfast time in all outlets for a duration of two weeks. 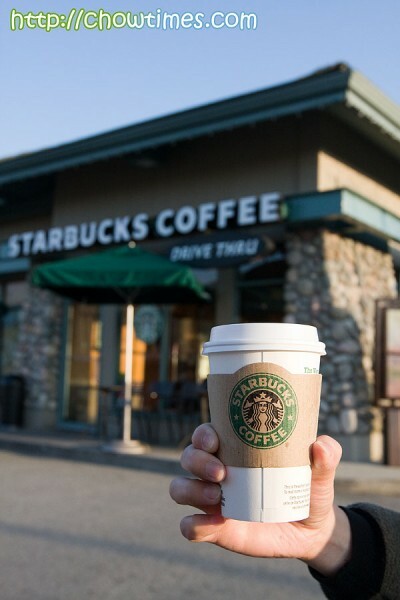 Starbucks reacted with a feeble attempt by giving free coffee for just a few hours. Suanne and I do not normally buy coffee. We make coffee at home and there is also a Starbucks coffee dispenser at work. Two cups in the morning is just about the max we consume everyday. Last Sunday, we decided to go check out what the fuss was. We woke up early, very early and drove to the Starbucks at Ironwood and bought a cup of Starbucks regular coffee. We then brought it across the parking lot to the McDonalds outlets to get the free coffee. OK, Suanne was afraid of being caught taking a Starbucks coffee into McDonalds, getting a free cuppa and then take pictures. It was quite obvious what we were doing to the people around us. LOL! Bear with me OK? 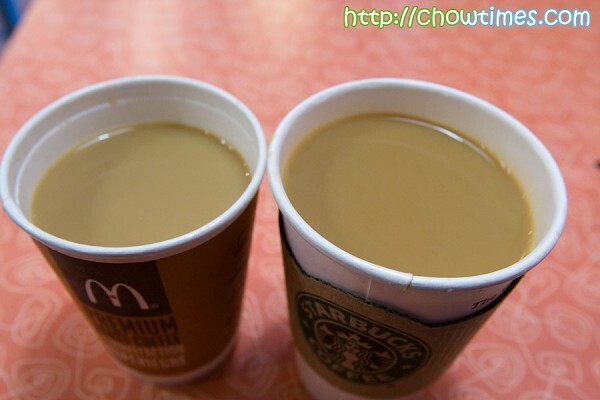 I am no coffee expert but this is just my way of comparing McDonalds coffee with Starbucks. First off, we are comparing apple-to-apple. Both cups are small coffee (McDonalds Canada does not have espresso yet, I think). Size wise, Starbucks wins with its taller cup, slightly wider cup. The Starbucks cup costs $1.65 while McDonalds is 22% cheaper at $1.29. McDonalds wins. The cup in McDonalds I heard was a new design which does not require a sleeve … Starbucks does. While the sleeve was made of recycled materials, still it is another piece of garbage that needed to be handled by the system. McDonalds wins here. Starbucks lid is of simpler design. 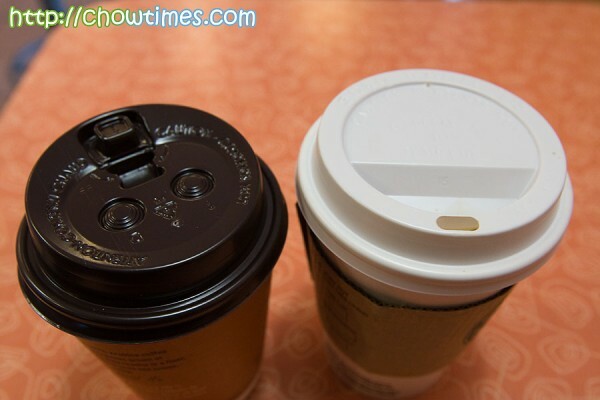 I like the McDonalds one which has a pullback tab which helps keep the coffee hot a tad longer. McDonalds wins. You probably read about how big a problem these coffee cups are to the environment. They had largely managed to figure out making the cups environment friendly but the biggest problem is with the plastic lids. They still have no solution to making a viable cheap alternative to the plastic lids. Oh, there are now proposals to start taxing plastic bottle (I know I am digressing here) in Vancouver. I think it’s a great idea but I know the Vancouver City Hall is up against powerful industry lobby groups. And now to the coffee. Starbucks serve the coffee with just the right temperature. I can just drink it the moment I get it. For McDonalds’, it was scalding hot when we got it that we had to carefully sip it in the beginning. Starbucks wins. Starbucks will hand you a cup and lets you add in your own sugar and cream — and you get to chose what creamer you want. In McDonalds, they ask you if you want sugar and cream and adds it for you. You, of course , could add in more if you want but what if you wanted less. OK, Starbucks wins. Taste wise … heck, I don’t know! Suanne says they taste the same … no difference. I felt Starbucks tastes like 2.4% better because I tasted a hint of bitterness in McDonalds’s cup. Starbucks wins. Smell wise Starbucks has a stronger coffee smell and so I gotta give it to Starbucks. Starbucks wins. It was one of those weekend mornings again. Suanne had a subtle way of hinting that she does not want to prepare breakfast but not wanting to say so. I don’t know how to describe it but I can pick up the vibes — unmistakably. I did not know where to go and the boys keep asking me what’s for breakfast. When I don’t want to answer, I just tell them “it’s a secret”. It used to work because they like surprise … not any longer. They now follow up with another question … “where are we going?”. They hate it when I drive across the bridge because it meant a 30 minutes drive, at least. I did cross the Knight St Bridge and headed up Main Street in Vancouver. Then at East 29th, I saw a queue outside of the orangey restaurant. It is definitely a dim sum place … and a cheap one too. I can tell because many of the customers are seniors or with large families. I thought we will not go wrong eating here since there was a queue even though the walls outside was all defaced with graffiti. This place is called King’s Chinese Cuisine and is located on the intersection of 29th and Main. The wait was not too long, about 15 minutes. We had to walk right into the back of the restaurant to deposit our name for a table. It is a large place and so they are able to turn the tables very fast. 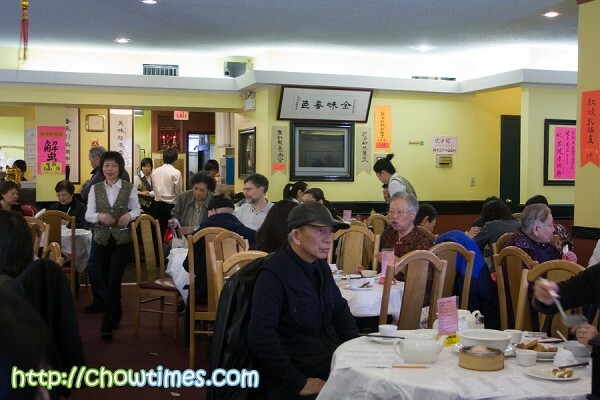 It is also a mad house … the hustle and bustle here is very typical of a neighborhood Chinese Dim Sum place. It’s noisy and obviously very popular. This is a place where they use plastic sheets for table cloth. With these, cleaning up a table for the next customer is just a matter of seconds. Pull up a layer, tie it up in a bundle with all the left over food and bowls and the table is all ready. Function over form is how I describe it. Even before we got seated, we were already asked what tea we wanted. I have no idea and I always kept my head down and pretend not to hear … I always left it to Suanne to decide. She had no idea herself too. So she always blurts out a name that comes to her mind. This time it was Tiet Guan Yin (Iron Goddess of Mercy). One of these days, we got to learn the finer points of Chinese tea. They also passed us the order sheet. This is not just an order sheet but also double up as a receipt! The prices were printed at the top of the order sheet. So, for $2.30 to $4.75, they are cheap. I see a lot of tables ordering the Fried Rice Noodles. It must be their specialty and they looked good too. You can tell when you see parts of it charred … meaning that they have “wok hei” when they did this. Kind of hard to explain what “wok hei” means — anyone wants to give that a try? The Fried Rice Noodle was good on it’s own. But the sweet sauce imparts a lot of flavour to it. 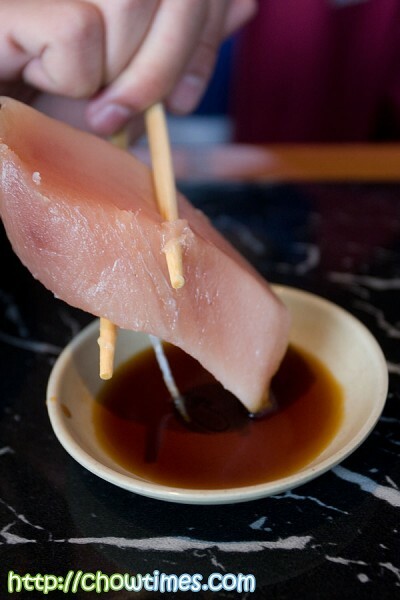 Their sweet sauce is done perfectly … not too thick and not too light … just perfect. No wonder so many people ordered this. This is categorized as a “special” dish and costs $4.75. 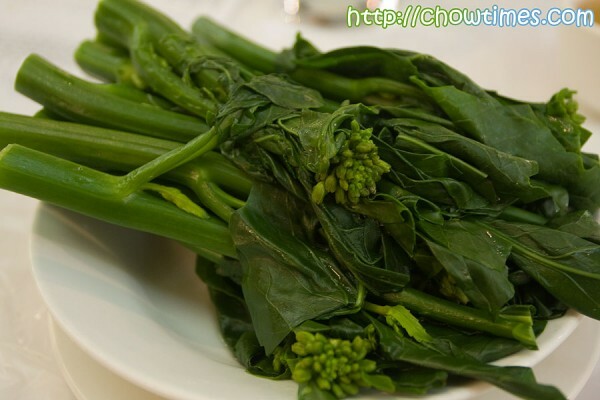 They serve their Gai Lan kind of dry. Normally in other places it is drizzled with oyster sauce but here they serve the oyster sauce in a small saucer on the side. The stems are big and tastes a little bitter’ish. It was a lot of it. Since the boys did not want to have anything to do with green food, Suanne and I had a tough time finishing it all. $4.75. We like this next one. It is simply called Jelly Fish. However, it is more than just jelly fish. 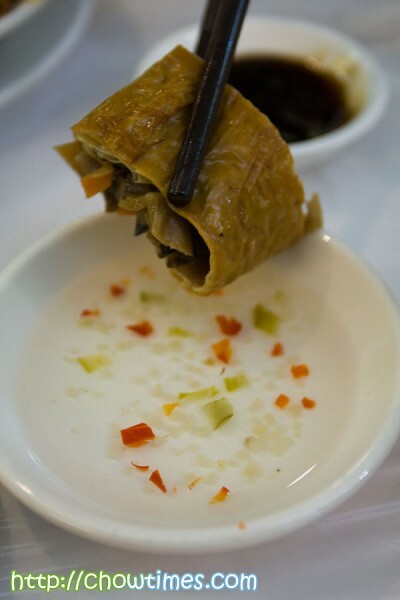 It is topped with bean curd roll filled with mushroom, pickled daikon and carrot. 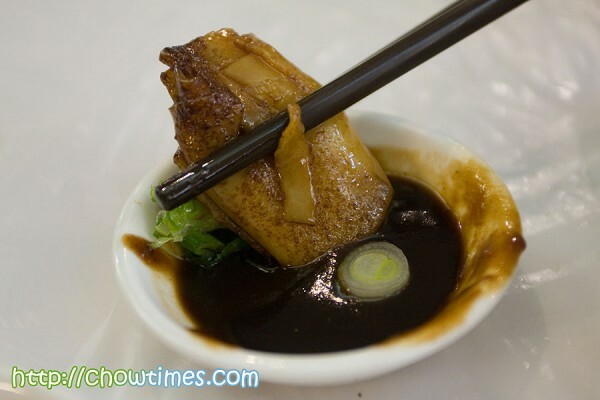 You can imagine the variation of texture in this dish (soft jelly fish with crunchy daikon). The light vinegar was just the right dipping sauce for the cold, almost bland bean curd. We like this a lot and it is $4.75. Here are some ideas for you and are some of our favourites. These are the kind of places we bring visitors to and if you like Asian food you will not be disappointed. With the great USD to CAD exchange rate, eating out will be cheap. 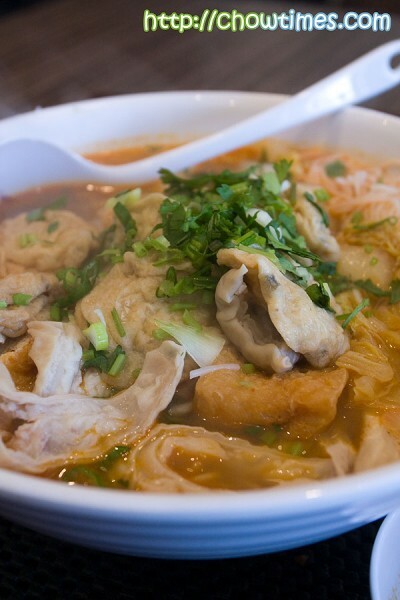 Long’s Noodle House: We just blogged about it two days ago. It is an awesome, smallish place but you MUST make reservations and be there ON TIME! This is a cheap to moderate kind of place. Song Huong: I think you will enjoy the seven course of beef. Not a fancy restaurant but fun to eat this. Cheap place. This one is Vietnamese. Au Petit: Their Vietnamese baguette is to die for. Grab one from them to-go. You must go early because they often sell out just after lunch time. Very nice and you will love it. Phnom Penh: Cambodian restaurant in Chinatown. You should make reservation here too. The must order item is their fried chicken wings. 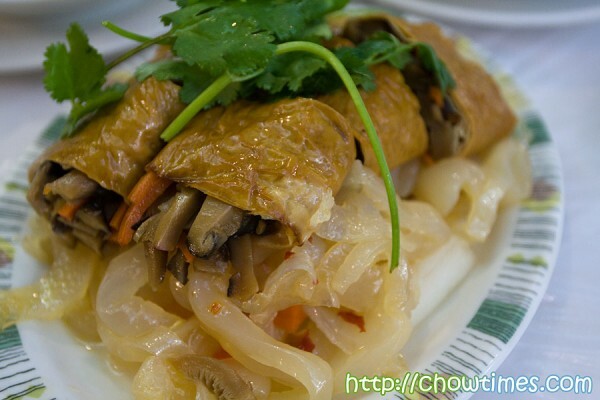 Popular Chinese Cuisine: Our personal favourite Shanghainese. Home cooking, little known. Talk to the chef and ask them for their recommendation. Also their Xiao Long Bao is our favourite. The Place: Awesome place, also Shanghainese home cooking. Good prices and good quantity. Kintaro Ramen: Japanese Ramen in downtown Vancouver. They are one of the top Ramen places in the world, so they say. Ninkazu: All You Can Eat Japanese. It is our favourite AYCE Japanese joint. 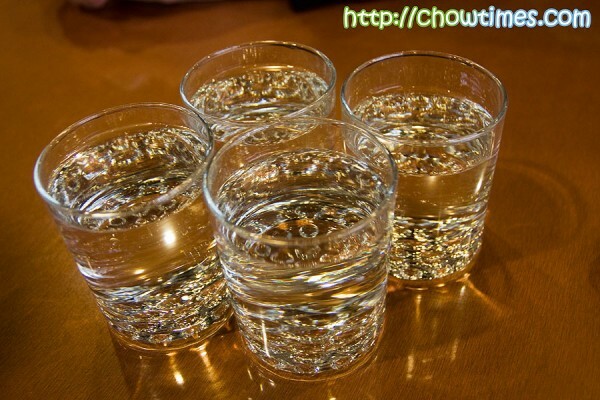 Well Tea: For Taiwanese, you will not go wrong with Well Tea. Try their hotpots. There are more … but let me know if you want more recommendations! All these places are cheap eats. So much too eat … so little time! Let’s all go ahead and confuse Patti, shall we? Just comment and give Patti your recommendations too. I can see she will seriously think of extending her trip to Vancouver. LOL! 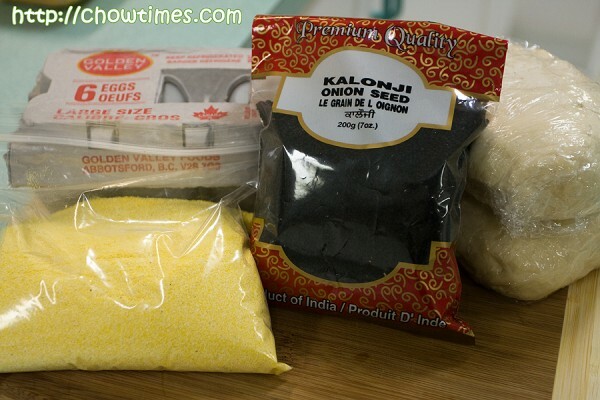 Shortly after we visited the Long’s Noodle House to try the Most Innovative Dish awarded by the Chinese Restaurant Award in Metro Vancouver, we set our sight on the next winner. Well Tea had been on our to-visit list for so long that it sort of dropped off our radar. Well Tea is located on Hazelbridge Way and Alexandra. 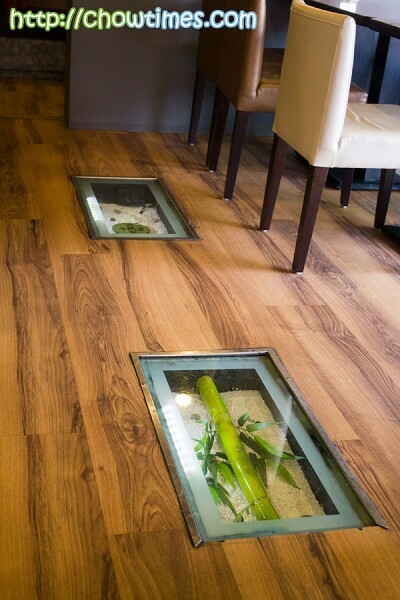 It is a Taiwanese Bubble Tea place. 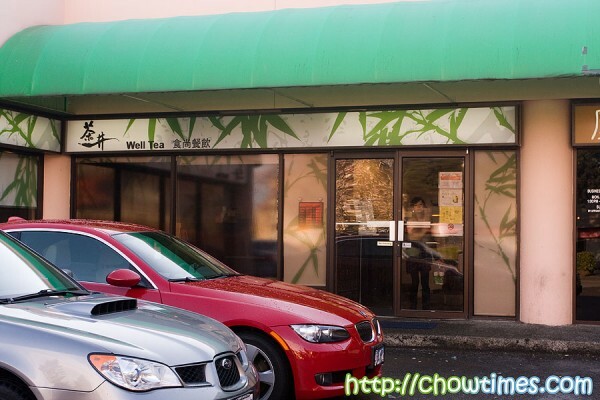 Well Tea has two locations with the other one located near UBC in Vancouver. What we found out about this place was a total surprise to us. In many ways we like the place. Looking from the outside, you can’t see much. I also find that the name Well Tea sort of unexciting because it conjured an image of healthy Chinese tea. To me, good food is not healthy and healthy food is not good! 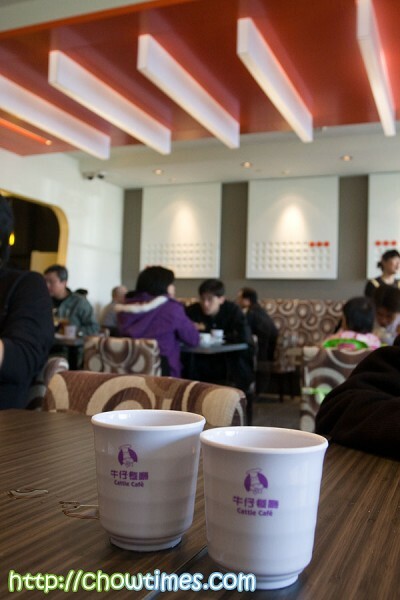 Like many Bubble Tea houses, Well Tea is also a youngster hangout. The interior is surprisingly very bright even though the windows were tinted and the restaurant is deep. From the outside it seems like it’s a small place but it actually is very big with lots of tables. We like the modern and clean interior which rivals Pearl Castle on Sexsmith. They have very imaginative decor. We also like how they space out the tables which leaves a lot of comfortable room to maneuver around. 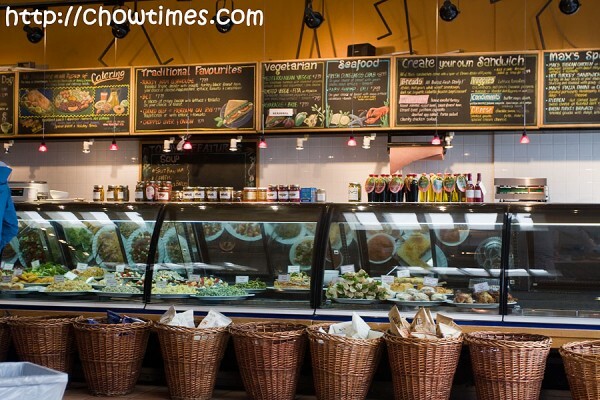 We are impressed with the service and noticed that they were well staffed with quite a lot of wait staff on duty. Come to think of it, many of the Taiwanese style cafes we went to are well staffed, with very young workers. The instant we were seated, they came by with glasses of water and the menu. We were given two menus. You might not have guessed that the bigger of the menu is for drinks. Despite the relative smaller size of the food menu, they were quite extensive. Nanzaro was quite amazed with their wireless service bell. Can you figure out what each of the buttons are for … particularly the one with the picture of a mug? 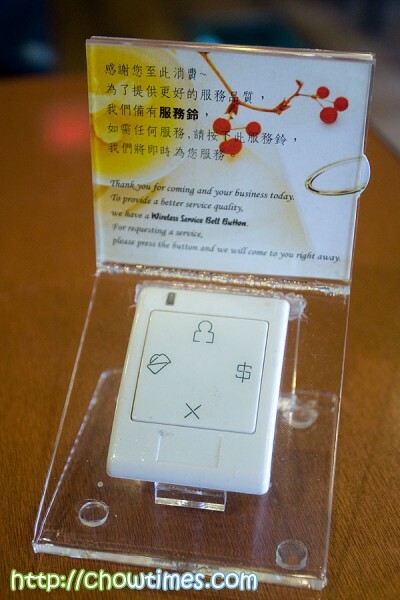 Nanzaro wanted to know how this whole thing worked, like how did all the wait staff gets alerted each time the button was pressed. He was given a mini tour of the system. From everything we observed, I think Well Tea places quick, prompt service as an important differentiation from their other competitors. We were truly impressed. For drinks, we ordered the Jaded House Special ($5.25). 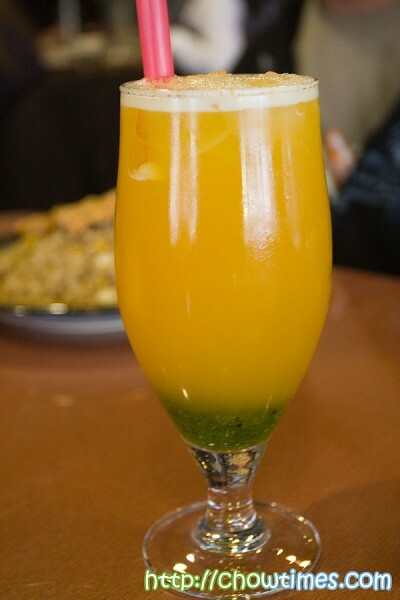 It is made of passion fruit, mango, orange, pineapple and kiwi fruit. It was fragrant but we felt it had too much flavor in this … too many fruits into this that it’s just a mishmash of flavor without any distinction. This is another great find. 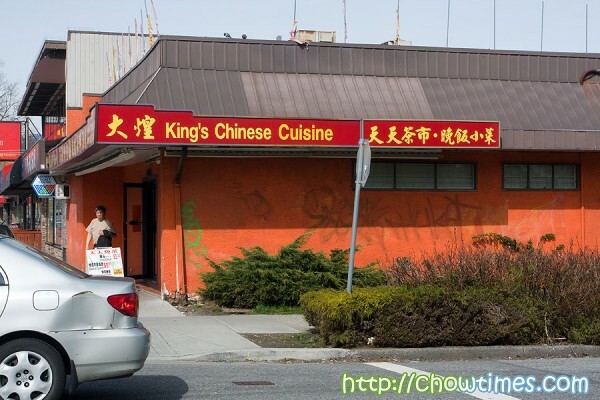 After all, this simple looking nondescript restaurant with an equally unimaginative name actually won the 2009 Most Innovative Dish title awarded by The Chinese Restaurant Awards in Metro Vancouver. We just got to try it. So, we decided to get hold of Whitney and Ken to join us since this is the kind of place where the more people you have the better. 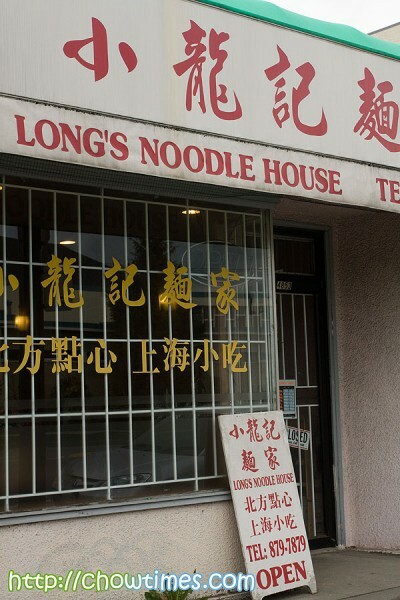 They should change the name Long’s Noodle House. 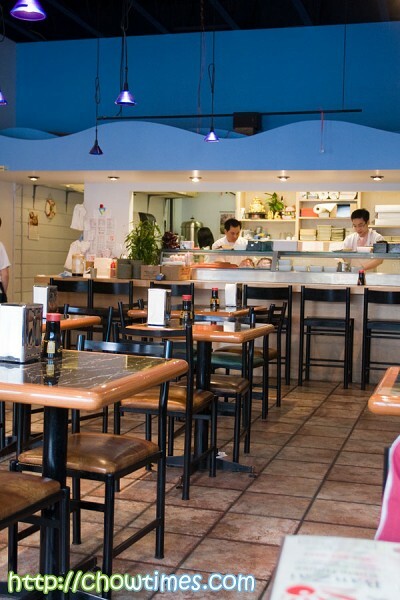 I think they have grown up … no longer a noodle house but a full fledged restaurant. Really, if you just drive past this restaurant you will definitely give this place a miss. The signboard is totally devoid of any design. Even the bars on the windows tends to tell you that this location is not too good part of the neighborhood. Long’s Noodle House is located on Main and 33rd. 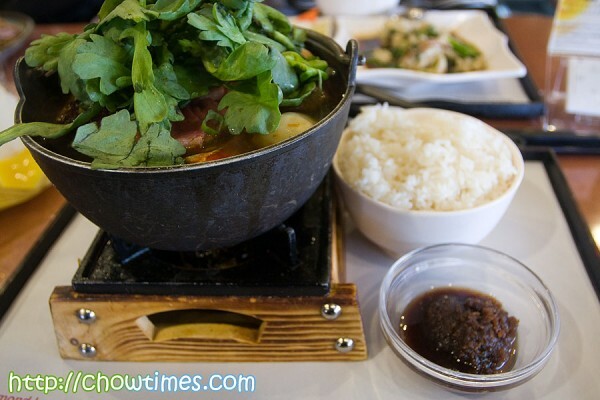 It is actually just next door to Au Petit, one of the most popular Vietnamese restaurant on Metro Vancouver. I think Long’s is a Shanghainese restaurant. The place is awfully small. You know, I think it’s good that they stay that way. I hope they never expand and keep doing what they do best. They are opened at 5:30PM for dinner. We were there about 10 minutes early and the waitress (Sandy was her name, I think) was very gracious to open up to let us in. I read that she is a super waitress who does everything in the front … take orders, deliver dishes, give you your bill, the whole shebang … all alone. And she does it so cheerfully too … we like her immediately. Well, except for one thing. She was so hell bent on making sure she maximize her table turns. When we told her we are a party of seven and that we did NOT have a reservation, she hesitated a while. You see, apparently ALL the tables were already reserved for 5:30PM except for this one table that fits seven just nicely … but Whitney and Ken was no where in sight yet. She wanted to only give us the table only if our entire party is present. So, I lied and told her they are just a couple of blocks away and pretend to call Whitney and Ken to confirm. Once she set our tables, we’re safe. Except that she came around every 5 minutes asking where they are! Sharp at 5:30PM, all the tables were filled up! Wow, I had never seen a place ran like this! It was a relief when Ken and Whitney turned up … at least I don’t feel so embarrassed for telling a lie. Mind you, Sandy is very gracious about it but I understand seeing how disciplined the other tables were. LOL! I knew we were in a right place that afternoon. I knew what I MUST have … the Most Innovative Dish in Metro Vancouver. The printed menu they gave us was not very extensive but quite respectable in terms of number of items. There were quite a few delicious sounding name. I know the best dishes are what is written on the board. Too bad they are all in Chinese and so we had to settle for what is on the menu. We rattled off our orders to Sandy — nine items in all. She did not even write it down and I was afraid if she will mess up our order seeing how busy she is. I asked her to write it down but she said it’s OK she got it. I was amazed here because she got everything correct when she brought a printout of the order to show us. 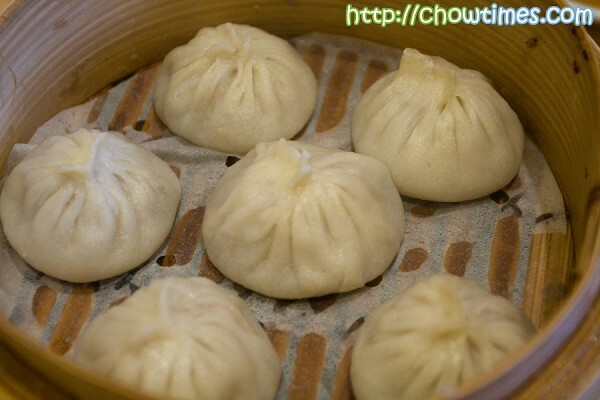 For starters, we had Steamed Mini Pork Buns (Xiao Long Bao). We like the brothiness in the bun but I would say it was quite OK, not great like the ones we had in Popular. No complain price wise though … it was just $4.95 for six. Whitney loves pig ears. She can talk and talk about where to find the best pig ears in Vancouver. So, I decided that we order this for her. This is $5.50 and we all liked it. The texture was what we expect of a good pig ear … crunchy. We eagerly waited for Whitney’s verdict. She gave the thumbs up. I wanted to be adventurous and went ahead to order the Salted Soya Bean Milk from their Dim Sum section of the menu. To me, the words salted and soya bean milk does not jive — just like sushi and curries, for instance. Sandy explained that they have two types of soya bean milk — salted (which is served hot) and sweet (served cold). The Salted Soya Bean Milk ($2.50) was served in a bowl and had thin slices of youtiao (Chinese donut) in it. Despite the name, it was actually not salty at all. I would describe it as savory. You should try it and see if you like it. Polly and I met again for our cake meet. We cant meet as regular as we like due to spring break or school Pro-D days. We enjoyed our ladies only cake meet where we can indulge ourselves with sweet treats and chat about anything, mostly about our children. Girl just need a girl friend to talk to. We had our cake meet at Max’s Bakery & Delicatessen on Oak St. Max’s Bakery & Delicatessen has 2 other locations, one on West 8th Ave and another on Granville Island which is known as Stuart’s Bakery which I had blogged about here. 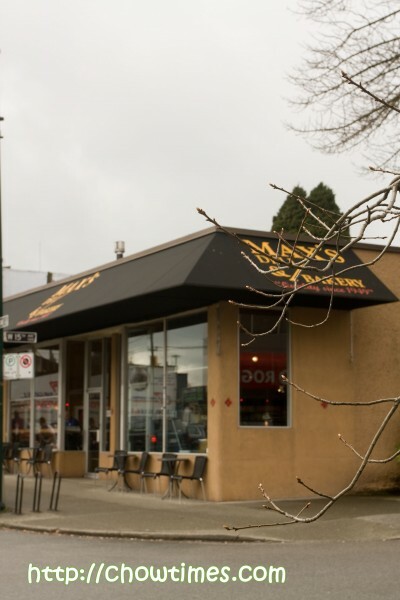 I have no idea that Stuart’s Bakery is a branch of Max’s until I checked Max’s website. We knew that this must be a busy location because they have a numbering system installed where you take a number and wait for your number to be displayed or called upon. They have lots of bake goods, pastries and cakes to choose from. We knew we’ll like this place the moment we walked in. One unique thing we noticed in Max’s is their one blade fan. I wonder if it’s more for decoration or function. 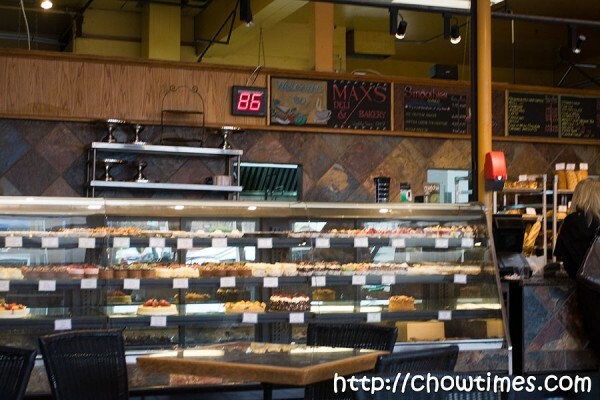 This bakery not only has lots of cakes and sweet treats, but they also have lots of savoury items to offer, like sandwiches, lasagna, roast chicken, salad, etc. We will be back to try their savoury items on our next visit. Carol, June and Karen were in-charged of making the anyway you like breadsticks for the South Arm Cooking Club for seniors. 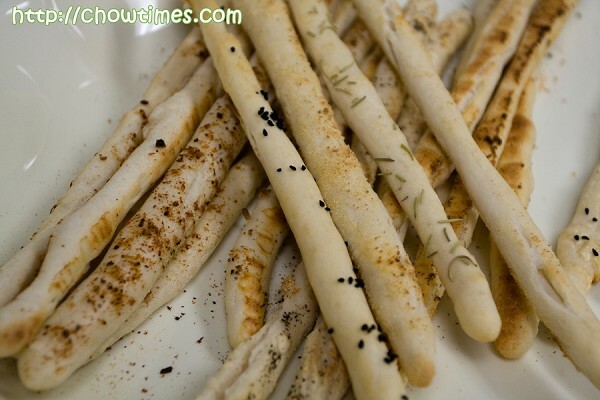 It is call any way you like breadsticks because you can vary the toppings to create breadsticks that could go with any sort of meal, from Italian to Mexican to Indian. The Breadsticks were very crispy and Charlene just cant stop munching on them. We made the breadsticks with parmesan and black pepper, dried rosemary, onion seeds and a pepper mix which Charlene brought fromher home. The pepper mix was from her friend who brought it back from overseas. I cant recall from which country. The baked breadsticks may be frozen, in sealable plastic bags for 1 week. Reheat in a 350F oven until crisp.